There’s so much fun to be had playing country and bluegrass songs on the ukulele. In this lesson, you learn an upbeat rhythmic country and bluegrass strum that you use to learn a famous song called Billy Boy. In the style of country and bluegrass, it’s all about the Boom-Chicka rhythm. For the boom-chicka rhythm, I recommend using a combination of fingers from the strumming hand. 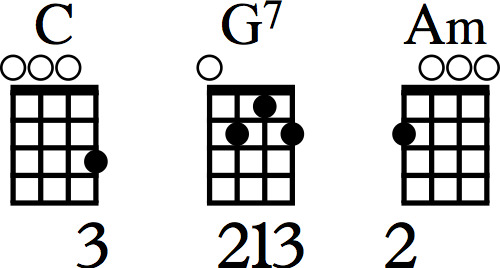 For the first beat, pluck or strum down across the top g-string with the thumb, as indicated by the “t”. Then, on the second beat, strum down across all strings with the nail-side of the middle and ring fingers. Then, on the “and” of the second beat, strum up across all string with the flesh-side of the index finger. Repeat this for the third and fourth beats. Practice this rhythm slow at first and gradually speed it up. Don’t speed it up if it hurts! Stay loose and relaxed. As you begin to speed up, the rhythm begins to take on an exciting, energetic toe-tappin’ strumming rhythm! Now, take the “boom-chicka” strum and learn to play a song. First, take a listen to a performance of the song you’re going to learn called Billy Boy. The first step to learn Billy Boy is to learn the chords for this song. The next step is to make sure you’ve got that strumming rhythm down. The last step is to strum through the song’s chord progression without singing. Don’t forget to start at a slow tempo first and count out loud. Once you can play it slower, then, begin to speed it up. Download the sheet music and chord chart for Billy Boy. When you put it all together, you have a nice rendition of Billy Boy played in a country and bluegrass style. You’re well on your way to being able to play in the country and bluegrass style! Not sure where to go next? Grab the free ukulele lesson book. How to play "I've Been Working On the Railroad"
Not sure where to go next? Join the free video lesson course. Join the FREE four-lesson course with 14 step-by-step videos that has helped thousands make music on ukulele. Perfect for beginners. Become proficient in strumming, rhythm and chord changes on the ukulele, improving your skills while learning actual songs. For players beyond the basics. Take your fingerpicking skills to the next level on the ukulele, learning fingerpicking pieces in four distinct styles. Written by Brett McQueen, founder of UkuleleTricks.com. Brett McQueen is the founder of Ukulele Tricks and author of the internationally-published book Ukulele Exercises For Dummies. He teaches thousands of people from around the world to play ukulele in a non-intimidating, easy-to-follow style. Read more.